As a volunteer on Projects Abroad’s Music Project in Bolivia, you will have the opportunity to give back through the medium of music by working alongside a trained music teacher at a local school or a center for the visually impaired. The work you will do is important, as music teaches new skills, allows people to discover their musical abilities, and often acts as a form of therapy. Bolivia is well known for its rich musical culture, so if you have a love for music or play an instrument then this project is perfect for you. Whether you are on a gap year, career break, or just have a deep love for music, you can share your musical knowledge with others and learn about music in a developing country. The Music Project is based in the vibrant town of Cochabamba. The project was founded by Projects Abroad and we work with two different placements. At the school, you will get involved with music lessons and extra-curricular activities. These activities are wonderful for personal development and help give students a safe space to learn and grow. At the center for the visually impaired, music is an effective tool to aid the development of children and teenagers. 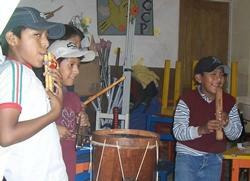 By exposing the children to different musical instruments and techniques and interacting with volunteers from all over the world, the students learn how to adapt and develop the communication skills they will need when they leave the center. At both placements, you will work under the guidance of a professional music teacher but you are encouraged to come up with new ideas and musical workshops for the children. The children are split into smaller groups depending on their age and musical abilities. This allows you to give each child individual attention and you can then focus on helping the children develop their musical potential while enjoying themselves and having fun! 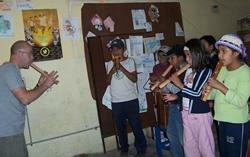 Appreciation and awareness- Bolivian folk music has helped to form the culture and history of the country. It is important that children carry on this tradition and learn more about the unique country they live in. Learning - You will help the children to discover and develop their musical abilities. Therapy - Music allows the children you work with to replace any negative thinking they might have with a more positive attitude. By learning a new skill, they gain self-confidence and build their self-esteem. The school and center have a wide range of both traditional Bolivian musical instruments (panpipes, bamboo flutes, rainsticks) and more familiar instruments that are used throughout the world (drums, tambourines, guitars). These will be available for you to use with the children. Volunteers will be working under the guidance of a professional music teacher however you will be encouraged to come up with new ideas and musical workshops for the children. The children will be split into smaller groups depending on their age and musical abilities. This will allow you as a volunteer to form a closer relationship with each child and focus on helping the children not only develop their musical potential but most importantly enjoy themselves and have fun! This is an enjoyable and worthwhile placement. By bringing energy, creativity, and an open mind, you will learn a great deal and your help will be appreciated. Depending on your preferences of how you would like to structure your time and the needs of the placements, you could divide your time between the school and the center. You could also combine your role as a music teacher with more general Teaching or Care work. Please let us know if you have any preferences when you apply. You can join the Music Project in Bolivia for just two weeks if you don't have time to join us for a month or more. This project has been selected by our local colleagues as being suitable for short term volunteering for both the placement and you, the volunteer; however, please be aware that you may not be able to make the same impact as someone volunteering for a longer period.